Photoshop Contest: Who Should Be the New Owners of the Country's Only Basket-Building? 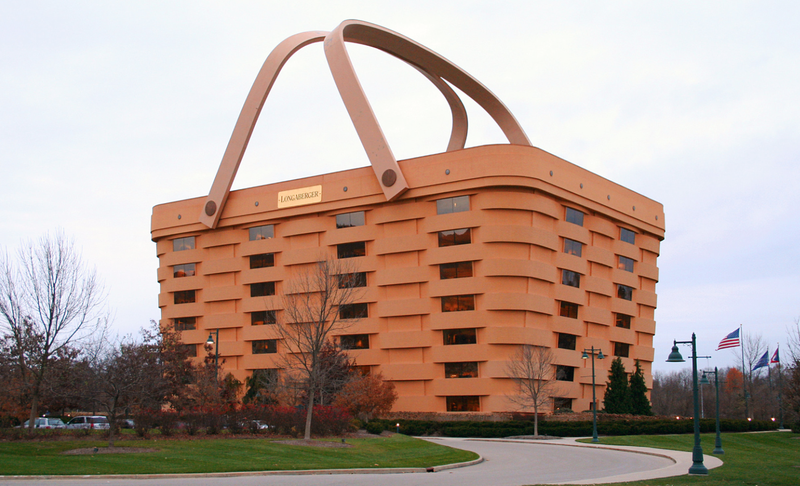 Life’s a picnic, or at least that’s what Ohio basket manufacturer Longaberger believed when it custom-built this headquarters for the company in the shape of its “Medium Market Basket.” Now the picnic’s over: The business is moving out, and the building is in danger of foreclosure. Completed in 1999, the Longaberger basket is not only one of the US’s roadside treasures, it’s a goddamn marvel of engineering. In fact, I recently chose it as one of my top seven examples of “programmatic” design, meaning it looks like what happens inside. Obviously no one wants to lose this kind of architectural treasure, so let’s help the city of Newark, Ohio to find a suitable steward for this Eighth Wonder of the World by visualizing its future. What company—or individual, or nonprofit entity, or sports franchise—should move into this basket to protect it from going to a special kind of hell in a handbasket? Upload your architectural vision for the new and improved basket-owner by the evening of Sunday, April 3 and I’ll post the best ones on Monday morning.